Student/Guardian must bring the qualifying report card to Bartow Ford and fill out entries at Bartow Ford. Only most recent report cards will be accepted. No photo copied or electronic report cards will be accepted. No credit will be giving for any hand written adjustments. The 4th grading period report card will not be eligible for this contest. Only report cards from the current school year will be accepted. The current school year begins the first day of school listed on the Polk County School Calendar (August 13, 2018). Report cards or transcripts prior to this date will not be eligible. Collegiate high school, dual enrolled, and private school students must have transcript in sealed envelope with raised seal or official stamp, from their administration office. Home school students: a parent- generated transcript will not be accepted, only sealed official transcripts from the following sources: Polk County Virtual School in Lakeland, FL. Student must reside in Polk County, Florida. At the time of drawing, if the winner is not at least 18 years old, the car must be titled in the winning student’s parent or legal guardian’s name. The winner will be responsible for payment of taxes and registration for the car. 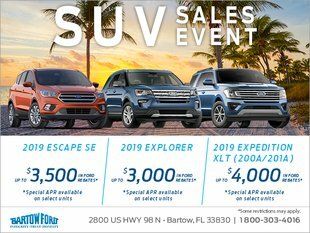 Employees of Bartow Ford and their immediate families are not eligible. Finalists will be announced the week of April 15, 2019. Only one entry will qualify per finalist and student must be currently attending school at the time of the drawing. The winner must provide their own insurance. *Bartow Ford reserves the right to edit or modify these conditions at management's discretion.